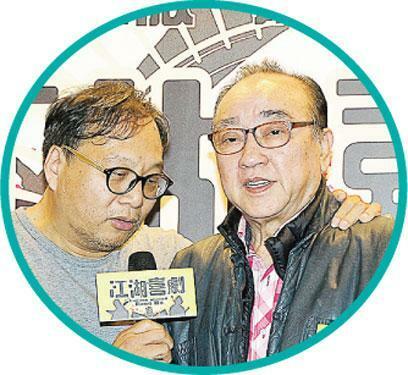 Director Lam Chiu Wing asks Lo Hoi Wing to "test the mic"
Artist Christine Ng Wing Mei two nights ago attended the film GONG WU HEI KET (MOB COMEDY) wrap banquet in Hong Kong. Speaking of "breaking the ice" with Joel Chan Shan Chung at Myolie Wu Hung Yi's wedding banquet, she said, "I only found out after reading the newspaper. No, I haven't mentioned Chan Shan Chung for so many years. No one knows if I was mad and I never mentioned it. This time we saw each other again we were fine, (Tavia) Yeung Yi brought him over to say hello, I was very happy to see him. I very politely gave him a hug. After greeting him I felt much better. We gave each other a nod and exchanged pleasantries." As for why she did not mention him for so many years, Ng Wing Mei said, "I wouldn't be so deliberately, undoubtedly something happened but did I have to broadcast it? If I was upset do I have to get into a fight? I am a big picture person, I know how to handle it. I just let it take its natural course. I wouldn't hold a grudge for life, I would only remember happiness for life." Alan Tam Wing Lun was asked about the Ng Wing Mei seduction scene. He said, "She is very hot, she was all over my thigh and I gave some reaction. (what reaction?) I howled like a hungry wolf." He also praised Jaime Chik Mei Chun for being just as "hot". "In one scene I carried her for three hours, I was hot and out of breath."